Eggs are a staple product in fridges throughout Alberta and across Canada, and egg sales have been steadily growing for the past decade. Consumers are curious to learn more about where their food comes from and how it was produced, so they can feel confident feeding their families. 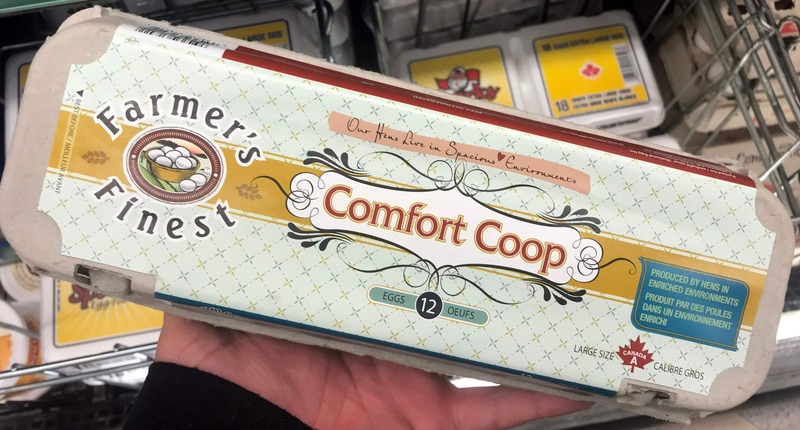 However, whether it’s at public events like the Calgary Stampede or during in-store appearances at grocery stores, the most common question people have for egg farmers is to explain the differences between all the various eggs for sale in the egg case! Regular white and brown eggs typically come from hens raised in conventional housing. 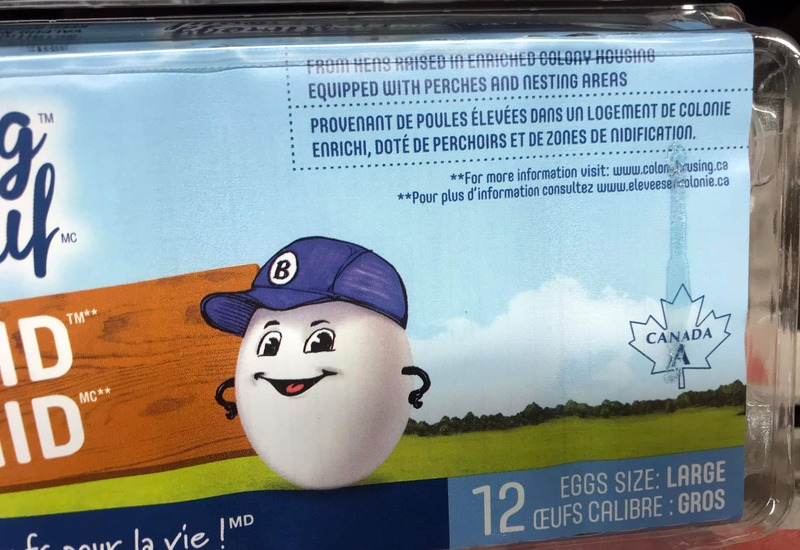 The Canadian egg industry is currently in the process of phasing out conventional housing; over 30% of Alberta egg production has already shifted to alternative housing. Most people are likely aware of two of the three styles of alternative hen housing – free-run (hens are free to roam around the barn) and free-range (free-run, with access to outdoor runs when weather permits) – since eggs from these housing systems have been available on grocery store shelves for quite a while and are easy to identify. 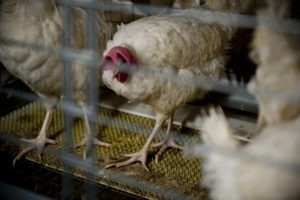 The newest alternative hen housing system is also the one that consumers are the least aware of. Within the egg industry, the system has been referred to as “enriched”, “furnished” or “enriched colony” housing. 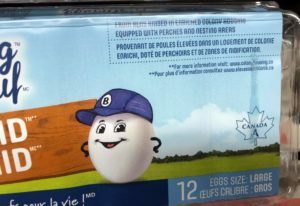 Things get even more confusing at the grocery store, where even more inconsistent terminology is used to market eggs from this hen housing system. 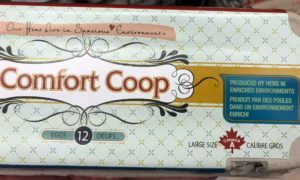 Here in Alberta, these eggs are sold as “Nestlaid” (Burnbrae Farms’ Naturegg brand) or “Comfort Coop” (Sparks Eggs’ Farmer’s Finest brand). For a quick history lesson, enriched housing has actually been around for nearly a decade. 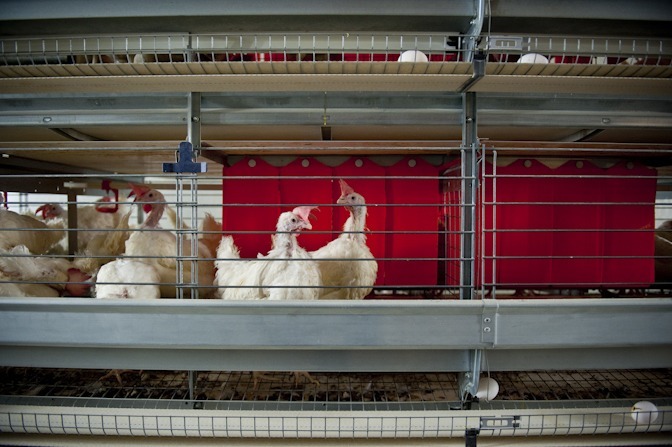 Canada’s first enrichable hen housing system (a style of conventional housing that could be converted to enriched housing) was installed on an Alberta egg farm in 2005. North America’s first two enriched hen housing systems were installed on Alberta egg farms in 2009. 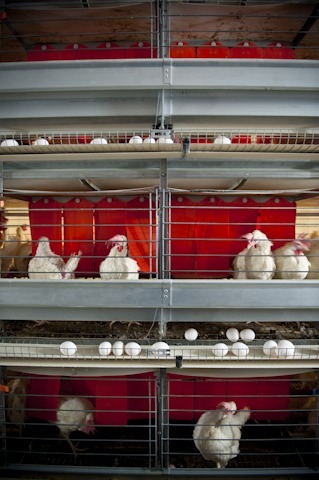 Alberta egg farmers have been at the forefront of adopting this innovative housing. So what is enriched housing? Enriched housing provides the same animal welfare and food safety benefits that conventional housing does, while giving the hens more space (both floor space and height) to move around. Those shared benefits include separating both the birds and eggs laid from the manure, which enhances food safety, and keeping birds in smaller groups. Small group sizes (25-75 birds in enriched housing, as opposed to 5-9 birds in conventional cages) not only allows the farmer to better observe the birds’ behavior, health and well-being, but also helps prevents some natural behaviors that can be detrimental to their health, such as feather pecking. By providing hens with enrichments such as nest boxes, perches, scratch pads and dust baths, enriched housing enables the hens to express a wider array of natural behaviors that are scientifically proven to have a positive impact on their health and well-being. The National Farm Animal Care Council (NFACC) updated the Code of Practice for the Care and Handling of Pullets and Laying Hens in 2017. The Code is the foundation for the Canadian egg industry’s mandatory on-farm Animal Care Program, and hen housing was a priority topic during the 2017 code review process. The Code calls for all Canadian egg production to transition away from conventional housing by 2036, into acceptable alternative hen housing systems that include enriched, free-run and free-range. Enriched is a relatively new and innovative hen housing system that is being adopted by egg farmers throughout Alberta and across Canada. Enriched housing is seen by many as providing the best of both worlds by providing high quality animal welfare for laying hens, while helping to keep eggs away from the birds and their manure in order to maximize food safety assurances. Enriched housing is a well-balanced system that marries the advantages of conventional housing with the enhanced ability for the hens to express a wider array of natural behaviors commonly associated with free-run and free-range housing. In fact, enriched housing performed very well on a comparative study completed by the Coalition for Sustainable Egg Supply in 2015. 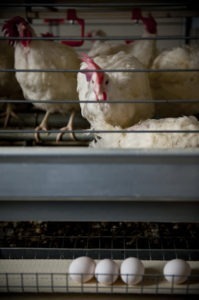 Consumers can feel confident feeding eggs from hens raised in enriched housing to their families. 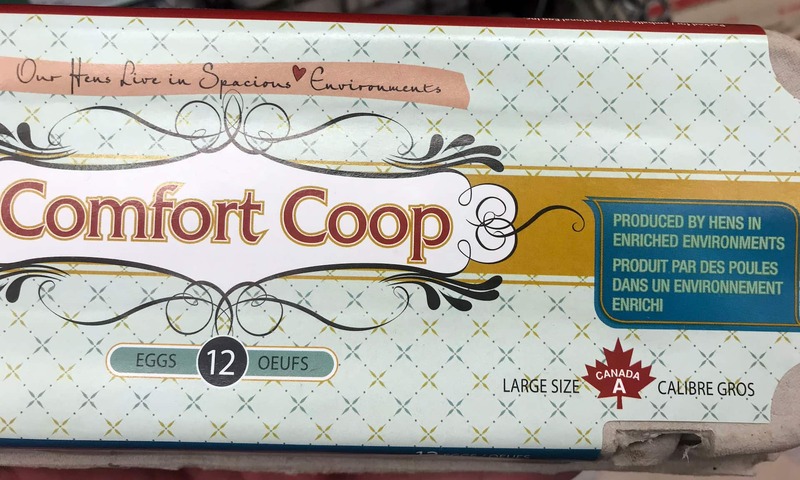 Eggs from local egg farming families with enriched housing in their barn are available all over Alberta, at every major grocery retailer. Just remember to look for eggs with the term “Nestlaid” or “Comfort Coop” on the carton! Laying hens in an enriched housing system, standing between the nest box and feed trough. Eggs gently roll out of the nest box and down the slanted floor to the egg belt at the front, while manure falls through the floor onto the manure belt. A closer look at the nest box, where the red shutters provide privacy for the hens to lay their eggs. A closer look at a perch within the system. At night, every bird will find a perch to sleep on. A closer look at a scratching pad within the system.